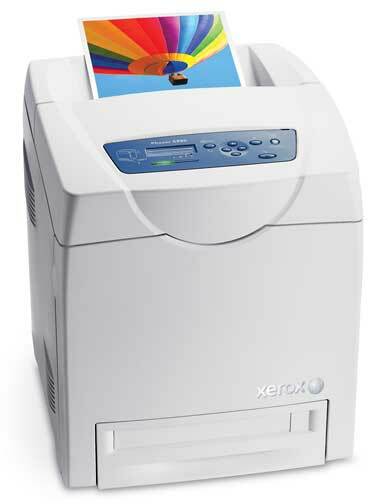 The Xerox Phaser 6280/DN is a moderately priced compact color laser printer that features automatic two-sided printing and built-in Ethernet networking. It produces sharp, clean text quickly, but it struggled to produce accurate color on photographic images and graphics. The 6280/DN was easy to set up, and once it was powered up and connected via Ethernet to our test network, it was recognized automatically via Bonjour, Apple’s zero-configuration networking protocol. You can also connect to the printer via USB 2.0. This printer can handle up to 400 pages in a standard paper tray, so small offices that print a large volume of documents won’t need to constantly refill. Its print cartridges are also high capacity, which means less time and money required for printer maintenance. According to Xerox’s published print cartridge yields, the price per black-only page is 2.7 cents; the price for a four-color print is 13.8 cents, about average for color lasers in this price range. When you print a page, especially a graphics-intensive document, the printer performs an automatic calibration, which adds a bit of time to the printing process. In our speed tests, we found the 6280/DN to be a middling performer in most cases when compared to other color laser printers we tested recently. The Phaser posted a fourth place finish in our 4-page PDF test, a third place finish in our Photoshop test print, and was in a three-way tie for second in our first page out test, at a respectable 17 seconds. The one speed test in which the 6280/DN excelled was our 10-page Word document, which it completed in just 33 seconds, about 18 percent faster than the Lexmark C544DN ( ). The text output was not only speedy, but of excellent quality. The 6280/DN didn’t do quite as well in our graphics tests, however. Our first attempts produced grainy images, with visible dot patterns. Using the Enhanced Image Quality setting instead of Standard made a big difference, but the image was still a bit grainy. I tried to adjust a few settings, but found the driver menus to be confusing. A call to the company resulted in my changing the Screening menu setting from Automatic to Finer, which helped considerably. One thing I had difficulty remedying was the red color cast in our Photoshop document. I tried adjusting the magenta color controls, but to no avail. A representative from Xerox said he got better results after changing the color mode of the document from RGB to CMYK, and that did help a bit. But I was unable to completely remove the red cast no matter what I tried. In the universe of sub-$1,000 color laser printers, the Xerox Phaser 6280/DN is a fair performer. It has high-capacity input trays and toner cartridges, and an average cost per print and purchase price. It’s fast at printing longer text documents, but slower at graphics-intensive documents. Its text quality is superior, but photographs had a persistent red color cast.